The older of two sisters, Jane Goodall was born on April 3, 1934, in London, England, into a middle-class British family. Her father, Mortimer Herbert Morris-Goodall, was an engineer. Her mother, Vanna (Joseph) Morris-Goodall, was a successful novelist. When Goodall was about two years old her mother gave her a stuffed toy chimpanzee, which Goodall still possesses to this day. She was a good student, but she had more interest in being outdoors and learning about animals. Once she spent five hours in a hen-house so she could see how a hen lays an egg. She loved animals so much that by the time she was ten or eleven she dreamed of living with animals in Africa. Her mother encouraged Goodall's dream, which eventually became a reality. Jane Goodall finally went to Africa when she was twenty-three years old. In 1957 she sailed to Mombasa on the east African coast, where she met anthropologist Louis Leakey (1903–1972), who would become her mentor, or teacher. In Africa, Leakey and his wife, Mary, had discovered what were then the oldest known human remains. These discoveries supported Leakey's claim that the origins of the human species were in Africa, not in Asia or Europe as many had believed. that as a woman she would be more patient and careful than a male observer, and that as someone with little formal training she would be more likely to describe what she saw rather than what she thought she should be seeing. In July 1960, twenty-six-year-old Jane Goodall set out for the first time for Gombe National Park in southeastern Africa to begin a study of the chimpanzees that lived in the forests along the shores of Lake Tanganyika. She had little formal training; still, she brought to her work her love of animals, a strong sense of determination, and a desire for adventure. She thought at the time that the study might take three years. She ended up staying for more than two decades. In her earliest days at Gombe, Goodall worked alone or with native guides. She spent long hours working to gain the trust of the chimpanzees, tracking them through the dense forests and gradually moving closer and closer to the chimps until she could sit among them—a feat that had not been achieved by other scientists. Her patience produced an amazing set of discoveries about the behaviors and social relations of chimpanzees. Chimpanzees had been thought to be violent, aggressive animals with crude social arrangements. Researchers had given chimps numbers rather than names and had ignored the differences in personality, intelligence, and social skills that Goodall's studies revealed. Chimpanzees, Goodall showed, organized themselves in groups that had complex social structures. They were often loving and careful parents and also formed attachments to their peers. They hunted and ate meat. And they used simple tools—twigs or grasses that they stripped of leaves and used to get termites out of termite mounds. This discovery helped force scientists to give up their definition of human beings as the only animals that use tools. In 1962 Leakey arranged for Goodall to work on a doctorate degree at Cambridge University, in England, which would give scientific weight to her discoveries. In 1965 she became the eighth person ever to receive a doctorate from Cambridge without having earned an undergraduate degree. By 1964 the Gombe Stream Research Center had become the destination of choice for graduate students and other scientists wishing to study chimpanzees or to learn Goodall's methods. The general public was also learning about Goodall's work through a series of articles in National Geographic magazine and later through National Geographic television specials. In 1964 Goodall married Hugo Van Lawick, a Dutch wildlife photographer who had come to Gombe at the invitation of Leakey to take pictures for the magazine. Goodall's son by that marriage, Hugo (more often referred to as Grub), was her only child. The 1970s saw changes in Goodall's understanding of the chimpanzees and in the way in which research was carried out at Gombe. In 1974 what Goodall referred to as a "war" broke out between two groups of chimpanzees. One group eventually killed many members of the other group. Goodall also witnessed a series of acts of infanticide (the killing of an infant) on the part of one of the older female chimps. These appearances of the darker side of chimpanzee behavior forced her to adjust her interpretation of these animals as being basically gentle and peace loving. In May 1975 rebels from Zaire, Africa, kidnapped four research assistants from the research center. After months of talks, the assistants were returned. Because of the continued risk of kidnappings, almost all of the European and American researchers left Gombe. Goodall continued to carry out her work with the help of local people who had been trained to conduct research. Later Goodall turned her attention to the problem of captive chimpanzees. Because they closely resemble humans, chimpanzees have been widely used as laboratory animals to study human diseases. Goodall used her knowledge and fame to work to set limits on the number of animals used in such experiments and to convince researchers to improve the conditions under which the animals were kept. She also worked to improve conditions for zoo animals and for conservation of chimpanzee habitats (the places in the wild where chimps live). In 1986 she helped found the Committee for the Conservation and Care of Chimpanzees, an organization dedicated to these issues. She has even written children's books, The Chimpanzee Family Book and With Love, on the subject of treating animals kindly. For her efforts Godall has received many awards and honors, among them the Gold Medal of Conservation from the San Diego Zoological Society, the J. Paul Getty Wildlife Conservation Prize, and the National Geographic Society Centennial Award. In 2000 she accepted the third Gandhi/King Award for Non Violence at the United Nations. Much of Goodall's current work is carried on by the Jane Goodall Institute for Wildlife Research, Education, and Conservation, in Ridgefield, Connecticut. She does not spend much time in Africa anymore; rather, she gives speeches throughout the world and spends as many as three hundred days a year traveling. Goodall, Jane. The Chimpanzees I Love: Saving Their World and Ours. New York: Scholastic Press, 2001. I'm doing a interview about her. It's amazing whaT you can do when you believe in yourself, and if you really have a passion for it. I care about the animals in the wild and you are so nice to care about these chimps the way you have. i believe that if others would follow your example then animals wouldnt be treated the way they are being treated today.i am glad that some people out there care like i do. but do you ever question yourself that your hard work will eventually turn into nothing.? like example if you were to work really hard & then your work that you have already accomplishedd hasnt payed off yet..? When did Jane Goodall die and how did she die? Can you put more information about her. I wish I could read more on Jane Goodall because she is really interesting. The part message on the front part where you click I wrote that for school. Jane Goodall is alive and well and is still traveling and lecturing in addition to all of her other important activities. In 2005 Goodall wrote a book titled, "Harvest for Hope". It is a wonderful addition to her long list of published works. This is where I learned about factory farming. This is an amazing woman with a powerful message. I hope she continues to influence many others to follow in her footsteps to help humans understand all animals-- even farm animals, so they can have a better life and we can learn to share the planet with them. Hi this is great info. At school we had to choose who we aspire to and I think I've found her! Oh and has she retired or still working with chimps? This woman is truly my hero. Has been my entire life. Do u no what jane's 2 younger sisters name's r? i really need 2 no! i'm doing an assinment on her and i need to no heaps about her! can u hook me up with any info? please send info back! Can anyone tell me who jane actually leads? 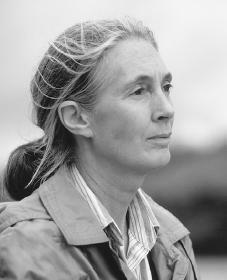 Jane Goodall I believe you are a wonderful person. I'm so glad someone takes intrest in animals just like you. I will be a vetranarian when I get older. I'm doing this project in science class. We were to pick any famous scientist and I immediately called Jane Goodall. I was so happy that I got to do her and this information is so good for my project that I'm bound to get an A plus!! :) Thanks and I love Jane Goodall!! Jane Goodall is a really strong and outgoing person. She is truly amazing.